This is a Mother's Day project I completed with Grade 3. I was working right to the wire on all the Mother's Day projects last week so I did not post it in time but it's a great project for anytime.....including upcoming Father's Day. 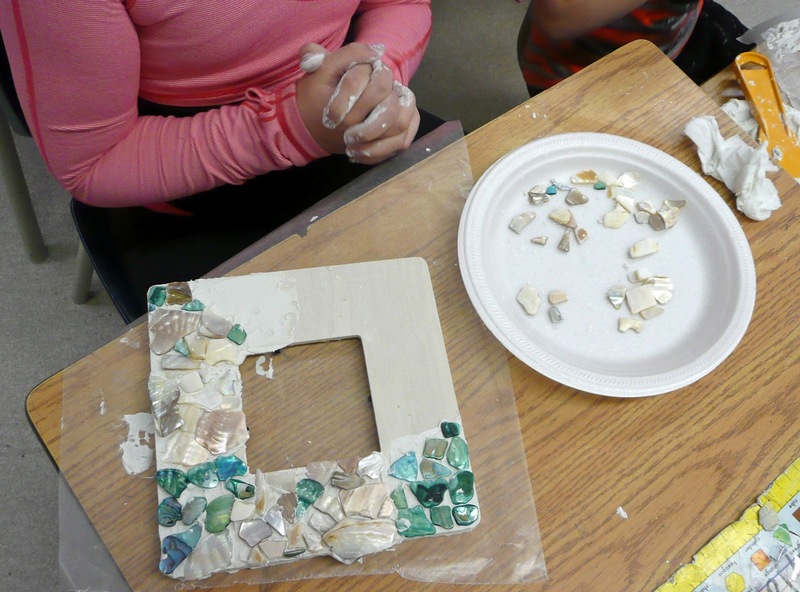 I had been wanting to do mosaics with Grade 3 all year and these turned out really well. 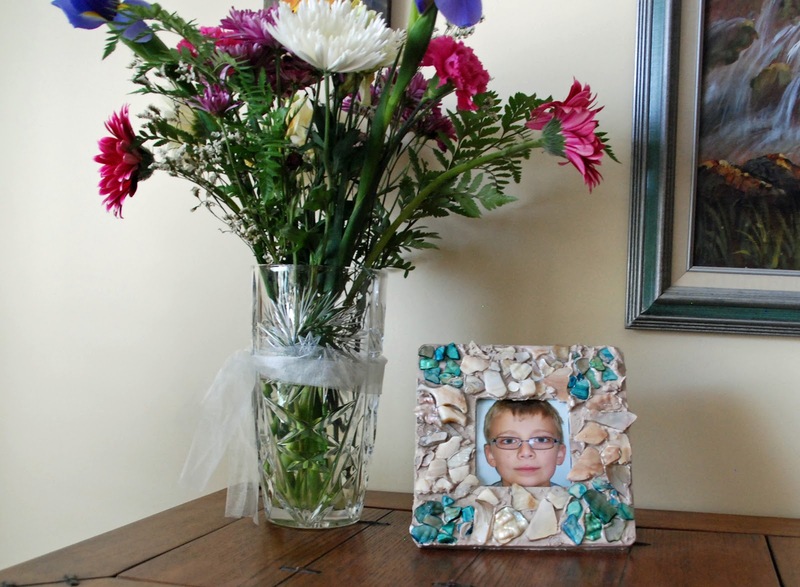 I happened upon these flat shell pieces on clearance at Michael's so that decided it. 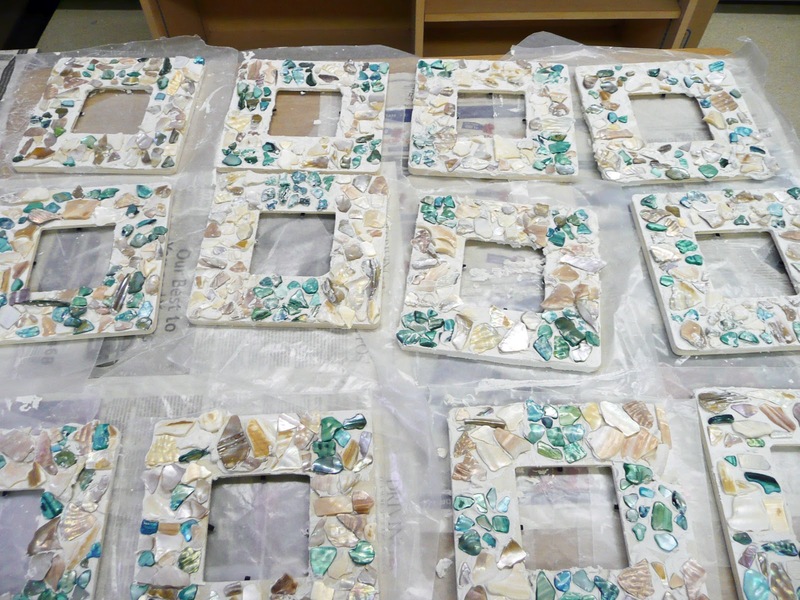 Instead of gluing and grouting we utilized our leftover drywall compound with amazing results. Lay down a piece of wax paper or newspaper on your work area. Take your frame, remove the center cardboard. Sand edges if required. Put some drywall compound on a recycled plate. In small sections apply some compound. You only want to work in a small area at a time as it will start to dry. It's like icing a cake. 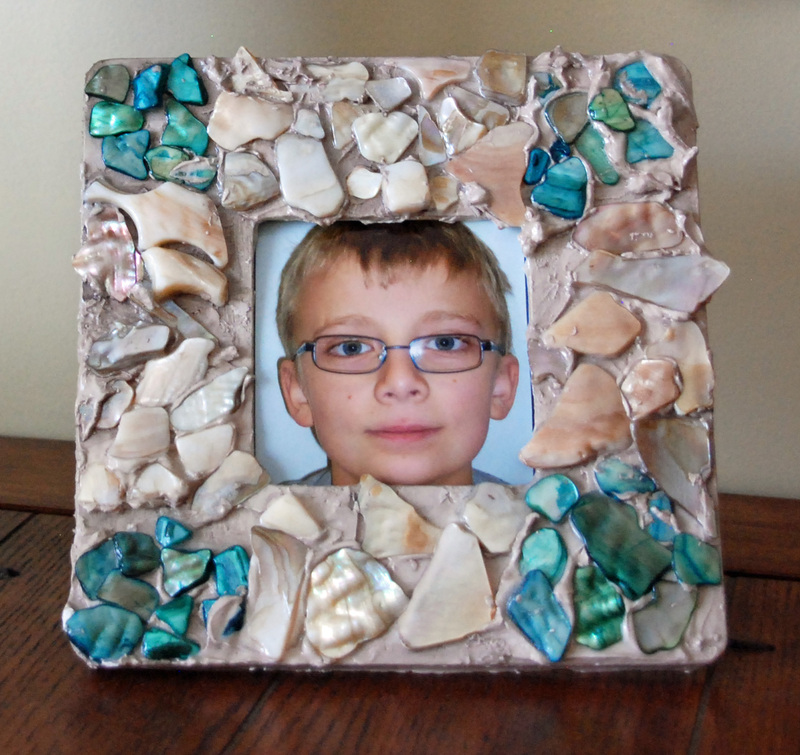 You want it to be thick enough to hold your mosaic materials but not over flowing. I asked the kids to think of it as a puzzle and try to fit as many pieces in as they could. You can see that hands were used just as much as spatulas! I also had them try to keep the mosaic pieces as clean as possible. We used kleenex to wipe off any excess. When we were finished we placed them off to the side to dry overnight. Now I forgot to take pictures of the next step. After the drywall compound had dried I put a small squirt of brown acrylic paint into a cup. I added enough water to make a wash, (like colored water). We then brushed this over the frames. 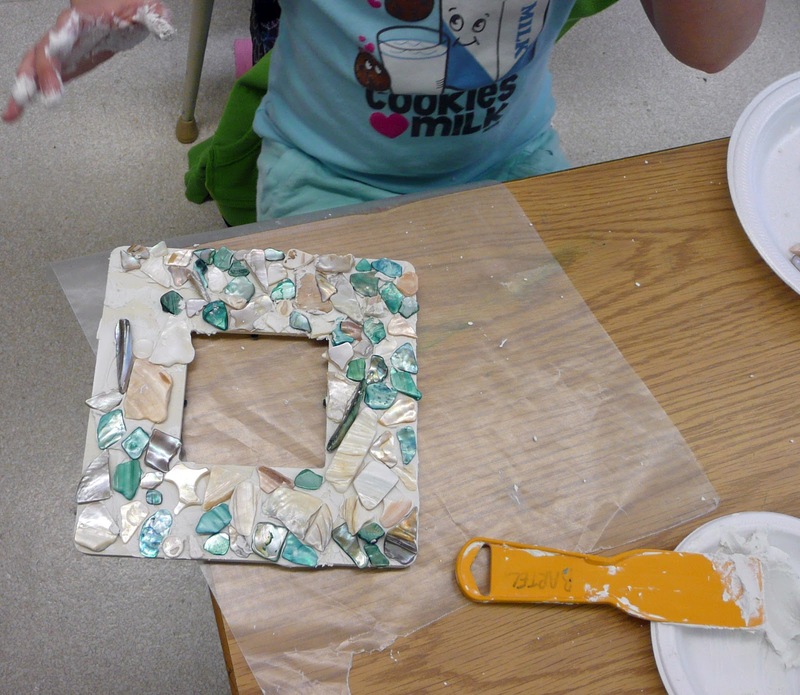 Using a kleenex blot off the wash from the mosaic material. 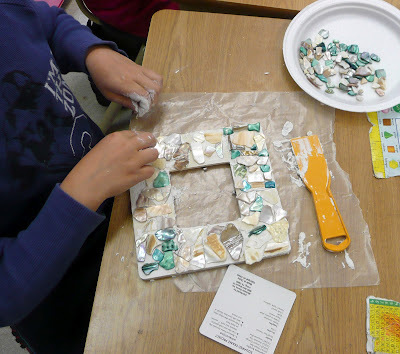 The dry wall is porous and will take on that colored wash very quickly. Start off with a very diluted wash as you can always add more color as you go. 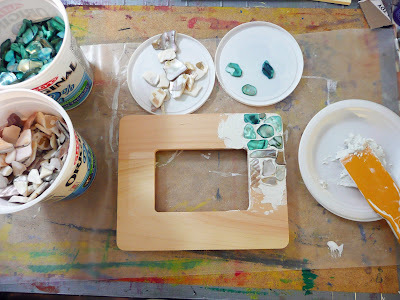 If you accidentally have too much paint color go over the area with plain water and blot to remove some of the excess color. Finally add a nice coat of Mod podge to get a protective shine. 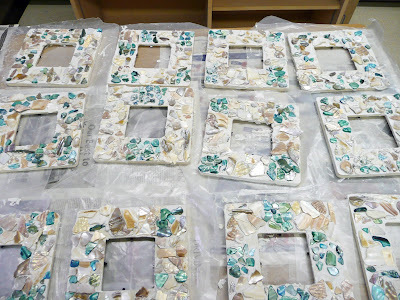 It also ensures all the mosaic pieces will stay stuck and strengthens the dry wall compound. Let the Podge dry and then add a picture and you're done. 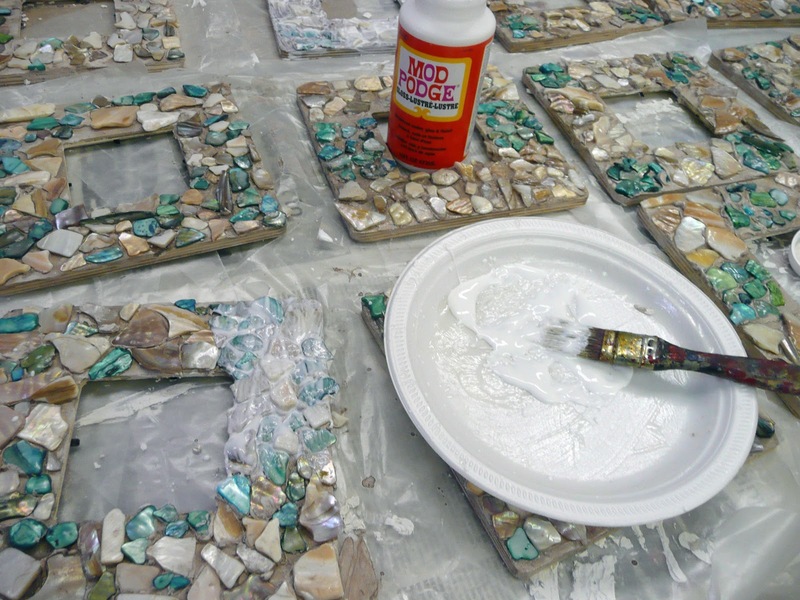 Once you try this mosaic technique with the drywall compound I'm sure you'll get lots of ideas of where you can apply other mosaics.